Lemon trees are fairly easy to grow in climate zones where winter temperatures usually remain above 32 degrees Fahrenheit. Three types of diseases can attack the leaves of lemon trees: fungal diseases, bacterial infections and viruses. Symptoms of lemon diseases include visible lesions and spots on leaves, curled leaves, premature dropping of leaves, scabs and cankers on fruit and bark, and yellow, white or pale green stripes or patterns on the leaves. Lemon leaves can curl when the fungal diseases called powdery mildew, greasy spot, anthracnose or scab attack your tree. Mildew is easy to spot because you’ll see a fuzzy white or gray coating on the leaves. Sulfur spray helps to control mildew. Greasy spot manifests itself through the formation of brown or yellow blisters on the underside of leaves, according to TreeHelp.com. Spray your tree with liquid copper fungicide if this disease occurs. 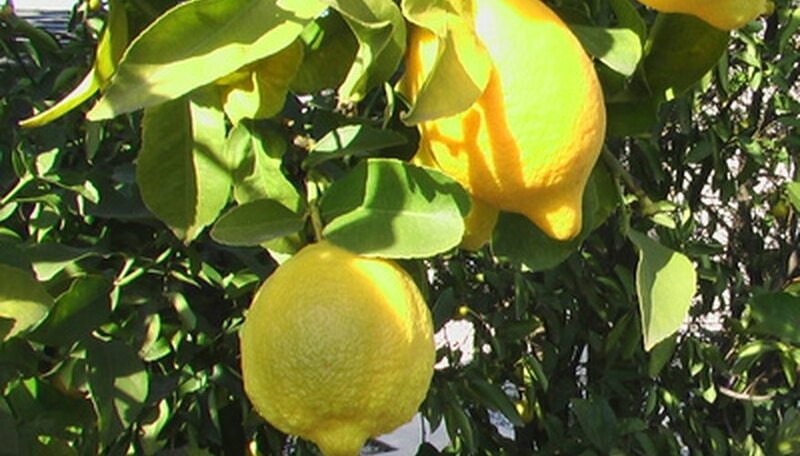 Anthracnose occasionally attacks lemon trees, according to the University of California at Davis. It can cause premature dropping of leaves but usually does not present serious problems to lemon trees. A spray of zinc or copper sulfate can knock out anthracnose. Scab afflicts many types of fruit trees, including lemons. If you notice raised, rough areas on leaves and fruit, you could have scab, according to the OurBrisbane (Australia) Web site. The site advises treating scab with copper oxychloride. You’ll know if your lemon tree has a bacterial disease such as citrus canker if you begin to see scabs or yellow lesions on the leaves, branches or fruit. Leaves will drop if your tree has a bacterial disease, and the entire tree will die back. The Online Service for Non-Chemical Pest Management in the Tropics, based in Germany, reports that citrus canker causes leaves and fruit to prematurely drop. Watch for white spongy spots on leaves that later turn into small craters. Unfortunately, you must remove and burn infected trees, but if you keep citrus leaf miners under control, you can help to prevent this disease. If you notice aphids on your lemon tree and then see yellowing leaves, the cause might be the citrus tristeza virus. Controlling aphids is the first step in treating this virus: Spray your tree with insecticidal soap when you notice aphids. Also, control ants, which bring aphids to the tree for their sweet excretion. One way to prevent this disease is to grow a variety of lemon trees, such as the Improved Meyer, which is resistant to citrus tristeza.